The panda (Ailuropoda melanoleuca, lit. 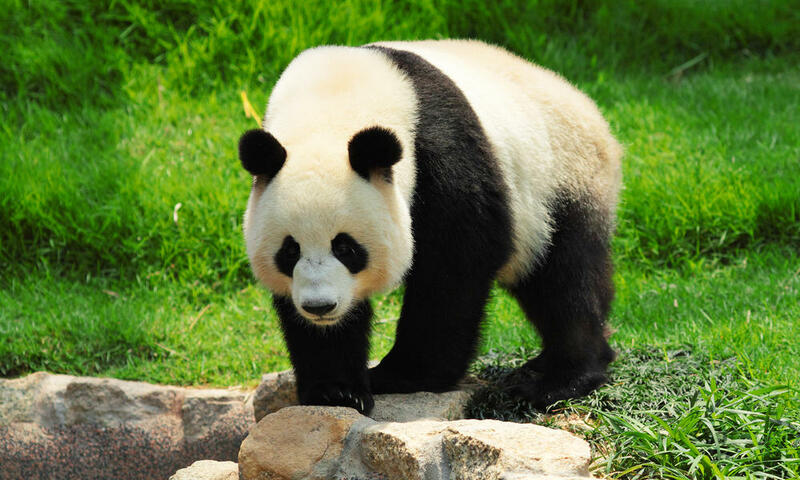 “black and white cat-foot”; simplified Chinese: 大熊猫; traditional Chinese: 大熊貓; pinyin: dàxióngmāo, lit.“big bear cat”), also known as panda bear or the giant panda to distinguish it from the unrelated red panda, is a bear native to south central China. It is easily recognized by the large, distinctive black patches around its eyes, over the ears, and across its round body. Though it belongs to the order Carnivora, the panda’s diet is over 99% bamboo. Pandas in the wild will occasionally eat other grasses, wild tubers, or even meat in the form of birds, rodents or carrion. In captivity, they may receive honey, eggs, fish, yams, shrub leaves, oranges, or bananas along with specially prepared food.